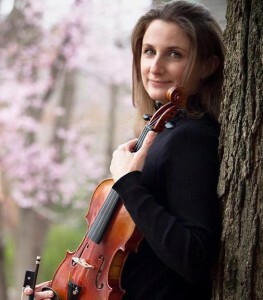 Nicola Gruen has a Bachelors from UC Berkeley, studying with Virginia Baker; and a Masters and teaching certificate from the Royal Academy of Music, studying violin on scholarship with Erich Gruenberg and chamber music with the Amadeus Quartet. Berkeley also awarded her a Hertz Memorial Traveling Fellowship, used to study violin with Emanuel Hurwitz CBE in London. Later she studied with the NY Philharmonic’s Yoko Takebe. From 1997 to 2002 Nicola performed in the Royal Philharmonic Orchestra, participating in regular live radio broadcasts (including the 1998 Mahler cycle), commercial recordings, and tours. She also freelanced with the Halle Orchestra, Ulster Orchestra, English National Ballet, Bilbao Opera, and others. She is recorded on numerous film soundtracks, including “Moulin Rouge,” and she played regularly in the award winning musical “Martin Guerre.” While living in Connecticut, Nicola was a member of the Huntsville Symphony (Alabama) from 2002 – 2010. She also freelanced with the New Haven Symphony, Stamford Symphony, Mimesis Ensemble and Sinfonietta of Riverdale, amongst others. Nicola Gruen relocated back to the Bay Area in January, 2013. She freelances with Oakland East Bay Symphony and is the strings teacher for California Symphony’s Sound Minds program at Grant Elementary School.